Family relations of the late Mary McCarron, Emyvale, came from Scotland to attend Mary's Months Mind Mass on Saturday, May 26th. They were regular visitors to Mary over the years and they loved coming to her home, when she lived on the farm in Golan. Mary's house was always a gathering place for people on Ceili and when she moved to Emyvale a loyal group of friends surrounded her and were daily callers to her. Weekend nights Mary's house was alive with the chat, the story-telling and the laughter and locals came to know her relations from Bangor and Scotland. The Scottish contingent remained in Emyvale for an extra 2 days after the Month's Mind and spent time with Mary's friends. I met up with them in the Four Seasons Hotel where they were chatting to three of those friends. I knew some of them from the days of Bingo and we recalled former times. They also told me of their visit to the farm where they spent many happy times on holiday and loved every minute of their stay. Sadly Mary has passed to her eternal reward which means that connection with Emyvale has now been broken but we hope that they can call again as they will always be welcome. 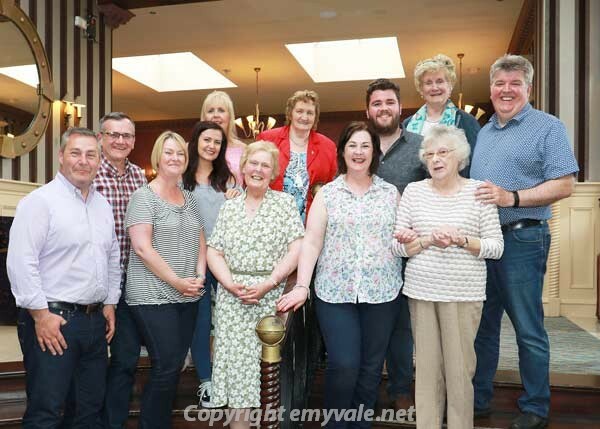 From Left to Right: Francis, Stephen, Colette, Amy, Catherine, May, Marie Kerr (Emyvale), Rosaleen, Ben, Maureen Sheridan (Emyvale), Marie Murphy (Emyvale), Martin.